Organized according to the sequence mental health professionals follow when conducting an assessment, Groth-Marnat’s Handbook of Psychological Assessment, Sixth Edition covers principles of assessment, evaluation, referral, treatment planning, and report writing. Written in a practical, skills-based manner, the Sixth Edition provides guidance on the most efficient methods for selecting and administering tests, interpreting assessment data, how to integrate test scores and develop treatment plans as well as instruction on ways to write effective, client-oriented psychological reports. 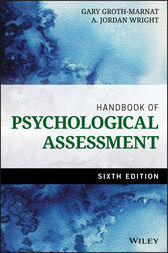 This text provides through coverage of the most commonly used assessment instruments including the Wechsler Intelligence Scales, Wechsler Memory Scales, Minnesota Multiphasic Personality Inventory, Personality Assessment Inventory, Millon Clinical Multiaxial Inventory, NEO Personality, Rorschach, Thematic Apperception Test, and brief assessment instruments for treatment planning, monitoring, and outcome assessment. GARY GROTH-MARNAT, PHD, ABPP, is an author, lecturer, researcher, and practicing clinical psychologist and neuropsychologist. He is Professor Emeritus, Pacific Graduate School, and a fellow of the American Psychological Association and the Society for Personality Assessment. A. JORDAN WRIGHT, PHD, is an Assistant Professor in Human Development at Empire State College, State University of New York. He is the author of Conducting Psychological Assessment: A Guide for Practitioners from Wiley.